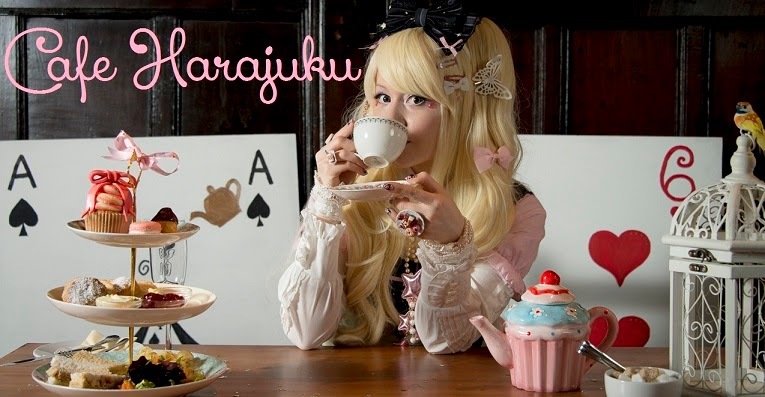 Cafe Harajuku by CanUdoitCat: Yoyogi Flea Market Hauls! The best chance to get many cheap and cute clothes in Tokyo is the Yoyogi flea market. I made a video about out market adventure the other week, let me fill you in on some more details of the day. First of all, check out the video to see what I "hauled" in. You really won't believe what bargains I fetched! My friends Sharon, Sophie, Nostique and I met in Harajuku and first went to the Evangelion Store in Harajuku, took some pictures and shopped around a little. We walked through the Harajuku Entrance of the park and turned left, walking up the steps and once we arrived on the top we got hit by the view of hundreds of people selling their goods. We browsed around and funnily enough we all found things that corresponded with out styles. Sopie got cute plushies and decorations for her house, Nostique got some lacy frilly skirts for her styles, I got the mix of funny things you have seen in the video. Best time to go there is definitely one hour before closing. I don't think I would have gotten the same deals if I had not been there around this time of the day. People don't want to carry all their things home. More info about the Yoyogi Flea Market is HERE. Thanks for reading! Stay sparkly guys!